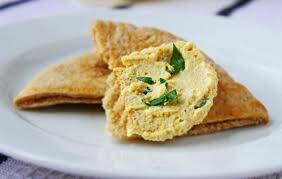 Place chickpeas in a food processor. Add garlic, tahini paste, lemon juice oil, and cumin. Keep processing until smooth. If the mixture is firm, add water. Serve with 2 slices of pitta bread. Sprinkle with paprika.